Windows registry is no marvel but most of the time it works. Until it doesn’t. Being obscure and not human-readable stuff there are very few ways to get information out of registry that belongs to offline (or just dead) Windows installation. Nirsoft had just released new utility that allows to export data out of offline registry files. When Windows is running working with registry is bliss of using whatever app (or programming language) you want. When Windows is not running registry turns into heap of dead files. RegFileExport is command line utility that takes raw registry files as input and extracts data from them. As usual for Nirsoft apps this one combines narrow focus with decent results. 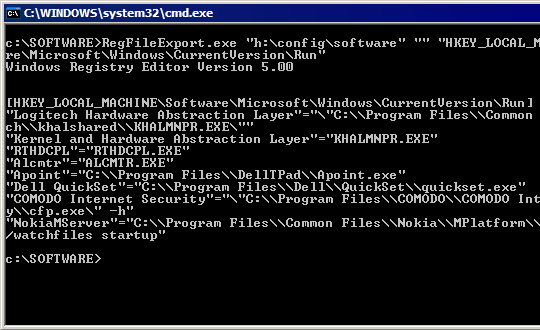 It can precisely target specific keys or branches to export and can output those to console or straight into .reg file. App makes no effort to provide graphical interface to help with actual access to registry files (as usual takes LiveCD or swapping hardware to get those offline). Unlike most Nirsoft apps that are quite user-friendly this is purely tool for power users. It comes with all advantages of such, but with all disadvantages as well.